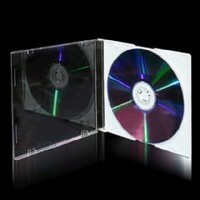 5.2mm slim cases and similar hard-plastic slim cases for CD and DVD. These cases go by various names such as Ultra Slims, Super Slims, Slimlines, or just "5.2s". 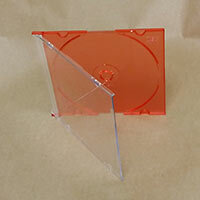 There are also 7mm Maxi Slims designed for holding CD J-Cards. 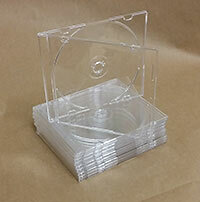 Super-slim CD box, only 5.2mm (1/4") thick, with a clear base. Pro-grade. CD super slimline with a tinted red base, pro quality. 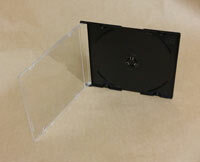 200 pieces of A-Grade Chinese Ultra Slim CD jewel cases, only 5.2mm thick, with a black base. Super-slim CD box, only 5.2mm thick, with a black base. 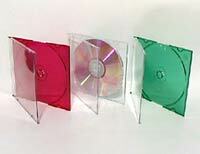 200 pieces of pro-quality Ultra Slim CD jewel cases, only 5.2mm thick, with a black base. 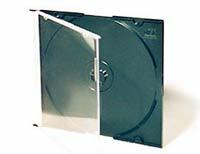 CD ultra slimline jewel case with a crystal clear base, pro quality, 10 pieces. 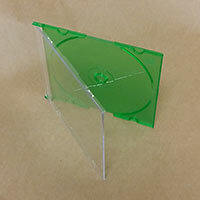 CD ultra slimline jewel case with a green base, pro quality, 10 pieces. CD super slimline with a purple base, pro quality. CD super slimline with a red base, pro quality. CD Ultra Slimline with a white base, pro quality.